Henry Turnbuckle is without doubt Jack Ritchies best known series character. Most of the stories featuring this fictional detective originally appeared in the pages of Ellery Queens Mystery Magazine throughout the 1970s and into the 1980s. 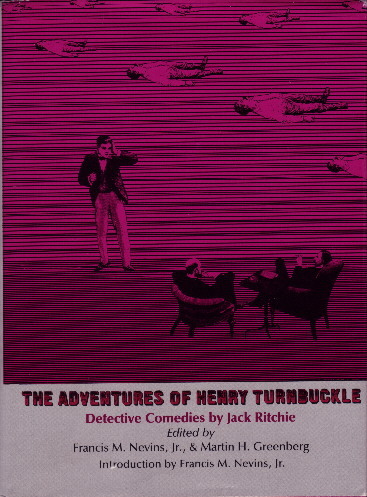 Fortunately for fans of Jack Ritchie, all twenty-six of these tales were assembled in the 1987 book collection The Adventures of Henry Turnbuckle, edited by Francis M. Nevins Jr. & Martin H. Greenberg. Published by the Southern Illinois University Press, this hardbound collection includes a fascinating introduction by Nevins, in which he provides various insights into Jack Ritchies life and career. Nevins also reflects on the Turnbuckle stories themselves, observing on how they developed over the years. The Turnbuckle stories represent some of the best writing of Ritchies career and the collection The Adventures of Henry Turnbuckle is a must have for any Ritchie fan. The two stories that open the series, "Take Another Look" (first published in Alfred Hitchcocks Mystery Magazine, August 1971) and "The Griggsby Papers", feature an early prototype version of Henry Turnbuckle, appearing under the name Henry S. Buckle. These two stories are different from those that followed in that they follow investigations into old, unsolved murder cases consigned to the police archives. Buckle attempts to unravel the mystery behind these half-forgotten mysteries. Although these stories were ingenious and funny, thereafter the emphasis of the series shifted away from historical detection. From "Bedlam at the Budgie" onwards, the Turnbuckle stories went from strength to strength, with the character assuming his proper name of Henry Turnbuckle. Though at times he is found to be operating privately, he nevertheless appears in most of the stories as a Detective Sergeant on the Milwaukee Police Force, along with his sidekick, Ralph. The Turnbuckle stories are parodies of the traditional detective formula, influenced heavily by the writings of John Dickson Carr and Ellery Queen. They are affectionate spoofs of the classic mystery genre that are nevertheless true to form and deftly plotted. Each story contains a number of clues that provide a challenge to the reader to solve the mystery. There is much humour to be had in trying to follow Turnbuckles train of thought as he attempts to unravel the mystery of each baffling case. Turnbuckle usually solves his murder cases in a roundabout fashion, often coming to the solution by accident. Many of his theories turn out to be "almost" right, though some prove, hilariously, to be way off the mark. Through it all, his focus and determination and love of a good puzzle shines through. At the end of nearly every story, Turnbuckle is to be found enjoying a glass (or two) of sherry, invariably to drown his sorrows and frustrations at the end of a difficult murder investigation. Humour plays an important part in the overall charm of the Turnbuckle series. Ritchies dry sense of humour sparkles in these tales. However, it should be noted that stories such as "The Fifth Grave" have a dark, almost hardboiled feel to them. The same cynicism that is to be found throughout Ritchies fiction is very apparent in the Turnbuckle stories. The characters that Turnbuckle meets in his investigations are almost always cold, manipulative and highly intelligent. This is true in particular of the women that Turnbuckle encounters, though some turn out to be kindred spirits! Jack Ritchies sharp dialogue also deserves a mention. Throughout these stories there are inspired and witty interchanges between Turnbuckle and his assistant Ralph. These often very funny exchanges serve to drive most of the stories to their conclusions. Turnbuckle invariably explains his theories to Ralph, who finds Turnbuckles thought processes difficult to fathom at times. Ralph is the perfect straight man to Turnbuckle, in that he acts as a sounding board to Turnbuckles imaginative theorising. The witnesses and suspects that are questioned by Turnbuckle in each story are also subject to his intricate and unique sense of logic and the dialogue that ensues is brilliantly executed by Ritchie. My personal favourites in the Turnbuckle canon include "The Hanging Tree", an offbeat tale with a supernatural edge, "Nobody Tells Me Anything", in which Turnbuckle has a particularly bad day at the office and the extraordinary "Hung Jury". The final story in the series was "The Two Percent Solution", which appeared (posthumously) in the June 1984 issue of Ellery Queens Mystery Magazine. I hope Ive inspired people who are new to Jack Ritchies work to seek out these stories for themselves. What Ive written above doesnt begin to do justice to the wonderful writing on display throughout the Henry Turnbuckle stories, but Id like to think this small piece does something towards promoting Ritchies unique literary talent. All of the stories above were collected in The Adventures of Henry Turnbuckle, edited by Francis M. Nevins Jr. & Martin H. Greenberg, and published by the Southern Illinois University Press in 1987.